The Reliant Kitten Register and the Cars it caters for. John Box, Tempest Cars, Simon Chisholm, Peter Davis, Liege Car Company, Adrian Hanwell, Daniel Lockton, Bob Neal. And of course John Pearce for his help in producing the document, not to mention his suggestion of the idea in the first place! The Reliant Kitten Register was very poorly named by Brian Marshall back in 1991. At that time Terry Scott was still running the Rebel Register, (first begun by Barry Jones of East Sussex, who passed it on to Tim Howie of Surrey before Terry Scott took it over when Tim emigrated. It is believed that Tim had managed to acquire the factory records from Reliant, relating to Rebels, but sadly they disappeared before Terry took over as Rebel Registrar. Terry passed the register on to Eric???? also from Surrey, but he did not advertise the fact and so it came about that the Kitten Register widened its field of interest.) though, as it happened, he (Eric) was just about to sell his Rebel, and stop keeping track of those fine wee cars. Brian had been trying, unsuccessfully, to coax Terry into widening his field of interest to encompass all of the under 1 litre 4 wheeled Reliants, and indeed all of their derivatives. So by 1993 The Reliant Kitten Register, having been formed in 1991, had a number of Rebel owners as subscribers and an invitation was sent to other Rebel owners, with the promise of a regular page in the magazine. By this time a number of Fox enthusiasts had also expressed an interest, and when it became apparent that the specials were welcome too, it was too late to change the name! Today, 2008, the Register has information on over 1000 vehicles, and enjoys the support of over 250 subscribers worldwide. 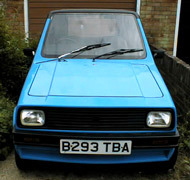 The RELIANT KITTEN REGISTER exists to promote the running, repairs and restoration of all models of sub-1 litre 4-wheeled Reliant and Reliant based vehicles. This includes Tempests, Vantiques and Asquiths, Salamanders, Ciphers, Jimps, Lieges & one-offs like the Bobcat & Sienna, as well as specials and of course Reliant’s own Rebels, Kittens and Foxes. By the late ‘90s it had become apparent that there was a need to have a document which gave a brief history of all the wee four wheelers, - I was having to relate the story over the telephone so often, and without pictures it is very difficult to describe things like the Bobcat for example, or almost any of the sports specials. Indeed Rebels and Foxes to those who have never seen one, are very difficult to describe in words alone - and as no one else was likely to compile such a document, I was “press-ganged” to have an attempt – so this is it! I know that it will possibly be incomplete, and, while as accurate as I can make it, not necessarily the whole story – but here is the latest edition, an effort to get something down on paper. I hope it is better than nothing - even though the odd figure quoted may be open to a certain amount of debate – I mean, who believes that they really built exactly 4,000 Kittens? In the beginning of the economy Reliant 4-wheelers, there was the Rebel, Reliant’s first venture into 4 wheeled economy motoring. Built initially as a saloon from 1964 till 1967 – the production prototypes were driven overland from the Anadol factory in Turkey for the 1964 Motor show! The estate car was introduced in 1967. 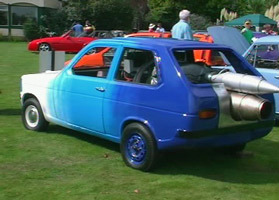 It (the saloon) started life with a humble 600cc engine, which was quickly replaced by the 700cc unit producing 24 BHP. In 1972 the 750cc unit was introduced, now producing 27 B.H.P.! and whilst production was really getting off the ground in December 1973, the model was discontinued, (last chassis number 94/1762) to be replaced a year later by the Kitten. Although the Rebel was manufactured for a decade, almost a quarter of them were built in the final year of production. A total build quantity of 2600 cars was claimed, of which about 850 were exported to a number of countries including Angola, Austria, Belgium, Bermuda, Cyprus, Israel & Portugal, 16 countries in all. The Rebel was road-tested no less than 3 times during its decade of production. I have copies of two letters from Reliant on file, dated about a decade apart, and both long after Rebel production ceased. Both written to answer the question “How many Rebels were built?” One mentions the 2600 number, the other (the more recent, but also the longest since Rebel production ceased) a figure of 4,000! I have yet to find a Rebel in Britain with a chassis number as high as 1800, and hence my comments about 2,600 produced and 850 or so exported. In December 1997 there were just 82 Rebels licensed on the roads of Britain. The Kitten, the first Reliant with rectangular headlamps, (unless you count the Bond Bug!) was launched in 1975, making its first appearance in fact at the 1975 Motor Show. A new saloon would have cost you £1.449.35, and an estate car £1,574.82. (A new Mini cost just about £ 999 at that time!) We are told that 4000 were built during the following 7 years or so, the situation is confused, as towards the end a number of ‘kits’ were offered to dealers and others to complete themselves. (At least one we know of was first registered as late as 1984!) The Kitten shared some body panels with the famous Robin three wheeler, and was available in saloon, estate or van form, the latter having round headlights and a lower ratio back axle. All three Kitten body styles used the same chassis! 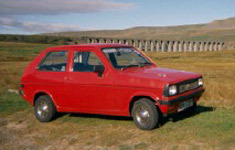 (Though it should be noted that there were ultimately three different Kitten chassis types, as they modified the design during its production life, the same rule applies, saloon estate and van are the same, but early and late ones differ) The Sipani Dolphin prototype first appeared in 1982, identical in appearance to the Kitten estate, though later dolphins had a different grille – there was even a 5 door version eventually. It is believed that the Sipani brothers who did a deal with Reliant were involved in a fraud case in the mid 90’s. By the end of 1997 there were 905 Kittens left in use in Britain, not a bad survival rate for a 22 year old vehicle! athough it is believed that as many again lurk awaiting re-discovery! Like the Rebel, the Kitten was built in L.H.D for export, mainly to Holland, Austria and Greece. 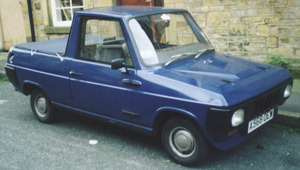 Production ceased in 1982, when the rights were sold to Sunrise Auto Industries in India, where it became the Dolphin. 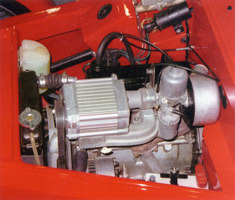 The Fox utility was introduced in 1983, based on the Kitten chassis, but galvanised, and with a couple of improvements. Originally designed by John Crosthwaite almost a decade earlier, It came in Pick-up, Utility and Hardtop versions, and could have either a fibreglass top or a canvas cover, rear seats were also an option. Also designed for assembly by Mebea in Greece as a RagTop with 10” wheels, the “Cub” (a Kitten based Moke type vehicle, also designed by John Crosthwaite, then Chief Engineer at Reliant.) It was during the Fox production run, from 1983 till 1990 that Reliant introduced a number of changes affecting starter motors, clutches, and a number of other components including carburetors and distributors, and so not all components are interchangeable, though complete units are. Total build quantity is variously quoted as 400 or over 1,000 depending on the source. One fact seems to be that they were also built under licence overseas, which may account for the conflicting numbers. 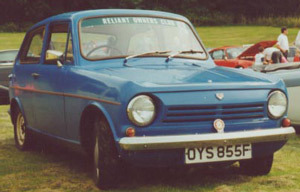 Reliant went into receivership during 1990, and Bean engineering took them over in mid 1991. 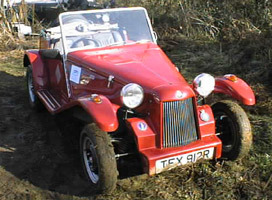 Bean only ever built 4 Fox chassis, and in fact they were all used to make Vantiques – see below. There were 310 Foxes licensed in the U.K at the end of 1997. Tandy Industries, an Isle of Wight based firm, produced a good quality two berth motor caravan conversion on the Fox chassis, and a number of these are still in use. They were built from 1984. (The firm went into receivership in 1996) Tandy Industries basic model the Firecrest was £6,650, and the higher spec Goldcrest was £7,350. Colin Dover was the man behind it, he went on to do interesting things with Citroen conversions – The last batch of Foxes left the Reliant factory without power units, and were fitted with electric motors for use by the Swedish Electricity Company. The last Fox chassis, believed to be 170199LA000616, was used to build a Vantique (see below, after Tempest). While all this was going on, the Kitten chassis had been identified as a particularly suitable platform on which to mount a number of body types, and John Box and Ian Foster (of Teal Bugatti fame), set about designing the Tempest sports two seater, The prototype was launched in 1987. The Tempest has earned an impressive pedigree of competition successes including a class win in the 2000 Association of Central Southern Motor Clubs Trials Championship, and a third in the RACMSA National Championship the same year by Jack Williams of Rougham. Some kits were also sold so that prospective owners could assemble their own, both during, and after this time. The rights to this fine vehicle were acquired in 2000 by Stephen Campbell, of Sportsman Ltd. who intended to re-launch it early in 2001. Following all manner of difficulties, Tempest cars was acquired by John Melody in 2006 and production is now back up to speed. Tempest Cars is now owned by Joe Mason. John Box had other strings to his bow, and during the Tempest’s time in production he was developing and building the 1930’s looking Vantique. As the name implies, it is a van. The prototype was first on the road on 1st Nov.1989, and the last of just 11 built was completed a decade later. In fact the first 9 were complete by 1993, the last one taking a little longer to finish! Vantiques incorporated the only 4 Fox chassis built by Beans. 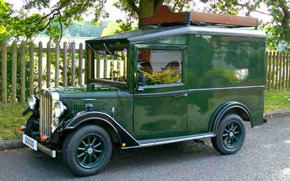 On the van front, the Asquith Motor Carriage Company of Great Yeldham in Essex produced the Asquith, another pre-war looking van on the Fox / Kitten chassis. Powered by Reliant’s trusty 850cc engine. 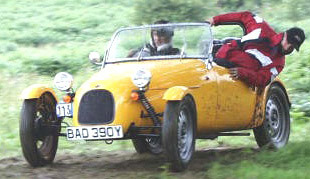 Asquith had approximately 40 chassis from Reliant. The body was very heavy, and the cast aluminum artillery like wheels were hard on the suspension. Some firms bought these as mobile advertising e.g. Jacobs (as in cream crackers) and ‘Hold Em Cars’ of Essex who use one as an advert for their car ‘Superstore’! 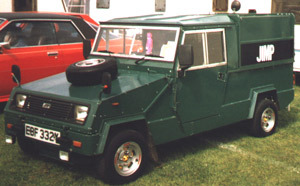 In the 80’s both the Jimp, a kind of mini Land Rover look alike, another of John Crosswaite’s designs, and the Salamander, intended as a replacement for the AC invalid car were built, the Jimp by Peter Kukla of Sandbach, from 1981 to 1984. The company folded due to funding difficulties. The remains of the Jimp stock was last seen in a warehouse in Manchester in 1988. One chassis, 8 body shells, (aluminum) and loads of parts, but the asking price of £4,000 was considered too high. It is understood that eventually some of them were turned into trailers. 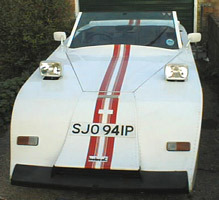 The Salamander was designed as a replacement for the soon to be withdrawn Villiers-engined “Invacars” and was commissioned by the Salford and Manchester Social Services (hence the name SALaMANder). Based on a, somewhat modified, Kitten chassis, built over a space frame, it was a 2 seater hatchback powered by a Ford 1,100cc engine and C3 automatic gearbox. Well specified with power brakes, electric windows & tailgate release plus a flat floor, with doors opening right town to the bottom of the sill, it was easy for the disabled to get in and out of, and to load a wheelchair into the rear hatch. In production from 1981 till 1984, by which time the current (then new) “Motability” scheme rendered a specialist disabled vehicle obsolete. The GRP body was flimsy compared to the Reliant ones, but quite adequate. Even earlier, about 1976, the need for a small British hand built sports car had been recognised, and Tony Stevens, now Professor Tony Stevens, came up with the very sleek Cipher which made its first appearance at the Birmingham Motor Show in 1980. Sadly only 6 of them were built, two in the Reliant factory at Tamworth, and 4 by Tony himself. The Cipher uses a lot of additional steel work to locate separate fibreglass un-stressed panels. One of these was eventually acquired by TVR for evaluation by John Box in 1983. It was eventually sold on through Harrogate Horseless Carriages. Two ‘kits’ were also sold over and above the 6 complete vehicles made, but their whereabouts is unknown. (worse than that, one of the kit owners rang the Registrar late in 2000 looking for a windscreen, - the kit never having been completed - and the contact was then lost!) It is not thought either of them was completed. Tony also built as a one off prototype before the Cipher in 1976, the Sienna. Like the Cipher which followed it, was based on the Reliant Kitten chassis and running gear. His son still drives the Sienna today. It is believed that 4 of the Ciphers now reside in Holland. In the background, one of John Box’s sons, Robert, had a year out from studying, and designed and built the one and only Bobcat in 1980 – well, that’s when he started the project whose design began in 1979, but a family house move got in the way, and the car was not in fact completed till 1984 ! It was a design exercise to make a Kitten do 100 MPH. Built on a 1976 one owner Kitten estate chassis Its very distinctive looks are striking. The aluminium body is not in fact particularly light, but the car is none the less very brisk. This vehicle was owned by Joe Boulderstone-Salthouse of Stockport from 1995 till 2000 when it was acquired by Steven Cambell of Tempest cars. It was subsequently acquired by John Pearce of Leighton Buzzard and sold on in 2007 to James Butlin from Higham Ferrrers in Northants, who is presently restoring it to run alongside his other Reliant special, the “Flying Bathtub”. Joe Boulderstone-Salthouse, the man from Stockport, also happens to own a Tempest, and is the Tempest Registrar. A number of other specials have been built on both new and secondhand Kitten running gear, perhaps the more notable being the “Black Prince”, built in 1984, designed by William Towns, one time designer for Aston Martin, who went on to style the Reliant Scimitar SST and Scimitar Sabre. While the Black Prince’s wings are made of fibreglass, most of the rest of the body and doors are made from plywood, covered in Vinyl leather. It was on the market in the 90’s with under 100 miles on the clock ! 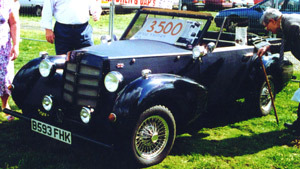 The name Black Prince was also used by Jowett in 1929 and Invicta in 1947. Then in the nineties, 18th March 1995 to be precise, Peter Davis formed the Liege Car Company, and began producing a lightweight 1950’s looking lightweight two seater sporting car which has a fibreglass body with integral floor, and utilises the Reliant 850 engine and gearbox. Like many good ideas, the initial thoughts and first drawings were in fact a decade earlier. The Liege ‘A’ frame chassis has double wishbone front suspension and an ‘A’ bracket and trailing arms at the rear. Kitten stub axles and hub assemblies are used along with a modified Kitten steering rack. This very light weight sports special has had numerous competition successes, and while the total number of orders taken by the end of 2000 was for 38, just seven of them had been completed and passed their SVA test by December 2000. Also developed by the Liege Motor Company:- 16” by 3.5” die cast alloy wheels, supercharger Kit, twin SU inlet manifold, and under development a 4 into 1 exhaust manifold and emission multi-point fuel injection. So, if it’s a different looking, good handling, economic and competitive fun vehicle you are after, with the potential to compete successfully. All you have to decide really is if you want it to have a fibreglass, aluminum of wooden body, and you’re half way do deciding which one is for you! A number of individuals have fitted non-Reliant engines into Kittens and Rebels, ranging from a Talbot Sunbeam 1 litre unit, through 1200cc Nissan, 1600cc Fiat, 1800cc Vauxhaull and 2 litre Ford, to even a Rover V8! Not forgetting a couple of motorcycle engines, in many cases more than double or triple the horsepower from even less weight than the Reliant unit ! A few racing specials have also been built, but sadly their owners are too busy enjoying themselves to have much time to write about them!